Details: Classical portico, shutters, dentil cornice, keystones, entry with fanlight and side lights. 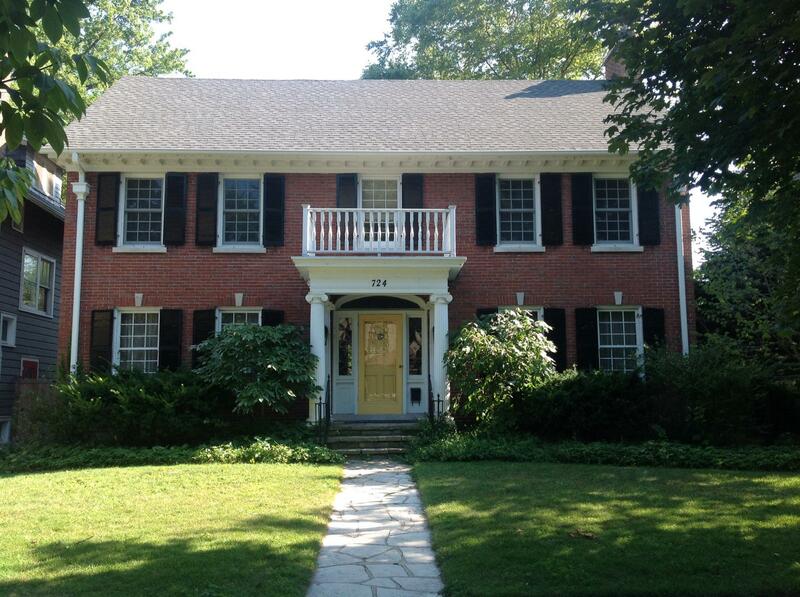 Historic Features: Classical portico entrance, cornice, entry with leaded glass fanlight and side lights. Alterations: Some windows are to have been replaced on front elevation. Exterior Alteration Permits: 12ROOF-0116: replace asph shingles on house and cedar shakes on attached gar with asph shingles and flat roof on 2 flr bitumin modified roofing; 04FRP0000000095: replace fence. COA Info: 12PRES-0084: Replace asph rf shingles on main house and roof cedar shakes on att gar with asph shingles (Timberline HD - 30 year); 05HIS0000000090: Remove side by side double double windows and install two new separate all wood double hung windows with SDLs (9 over 9 panes) on the first sty of the E elevation of main house (kitchen area). Infill window opening with existing brick from new openings or with new brick to match size, color, and texture of existing brick.